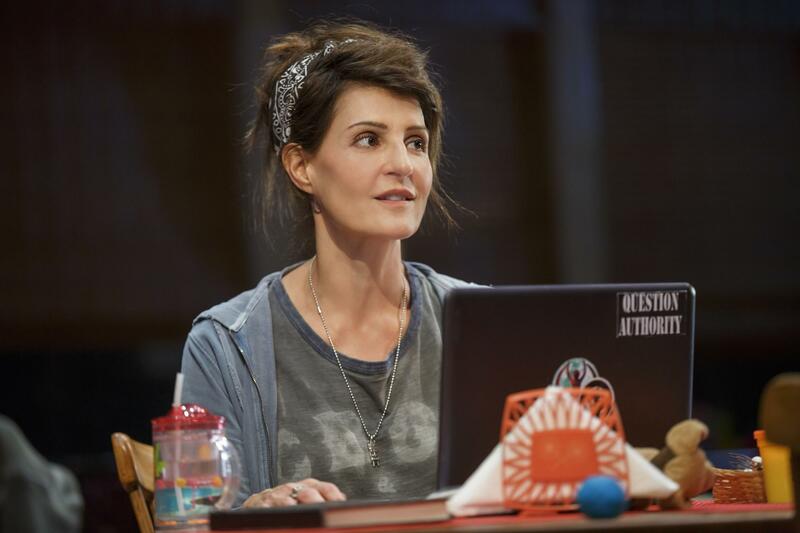 Nia Vardalos stars in Tiny Beautiful Things, a stage adaptation of Cheryl Strayed's book of "Dear Sugar" advice columns. Now that town square is the Public Theater in New York. Actress and writer Nia Vardalos, of My Big Fat Greek Wedding, and Thomas Kail, the director of Hamilton, have collaborated to create an unlikely off-Broadway play based on Strayed's bestselling book of advice columns, Tiny Beautiful Things. The set is a kind of messy house where Vardalos, as Strayed's alias, Sugar, makes lunch for her kids or folds laundry, while she answers questions from three actors who inhabit the very same space, playing a variety of ages and genders. "You know who I am. I reveal myself to you in every column," Strayed's character "Sugar" says. And, in revealing herself, Sugar reveals more about our common humanity, without ever telling people what to do or how to think, says Vardalos. Sugar's not Dear Abby or Ann Landers: "Cheryl uses storytelling to reveal something about herself," Vardalos explains, to "make the person feel like: It's OK, it's OK. You show me yours, and I will show you mine." The play came about because a friend gave director Thomas Kail the book Tiny Beautiful Things, which he then gave it to Vardalos. She read it cover to cover on a flight from New York to LA, and through her tears, called Kail on the tarmac to say she wanted to adapt it. But she knew it couldn't be a traditional theatrical narrative. "Rather than try to create something that I'd seen before, I thought: I don't care if this is a play, if it's a monologue, if it's a theatrical experience," Vardalos recalls. "I can't worry about the finished product. I'm just going to explore." Kail says that exploration has yielded an unconventional and emotional 75-minute theatrical journey. "I wanted it to be an experience where you walked into the dark and this thing unfolded and there was some sort of ritual that was embraced ..." Kail says. "It was not about plot. It was about feeling, it was about empathy. It was about being heard." Kail says there's a reason Strayed's words resonate — and why so many people give her book to one another. It's "about something very simple," he says: "I see you. I hear you. You are known." He hopes audiences feel the same way. Take a book by Cheryl Strayed, the author of "Wild," actress and writer Nia Vardalos of "My Big Fat Greek Wedding" fame and the director of the Broadway sensation "Hamilton," put them all together and what have you got? An unlikely off-Broadway play based on Strayed's bestselling book of advice columns, "Tiny Beautiful Things." It opens tomorrow, and Jeff Lunden has this preview. JEFF LUNDEN, BYLINE: Cheryl Strayed started writing "Dear Sugar," an online anonymous advice column, when she was still an unknown author. She says the emails people wrote prompted responses which made her explore her own life more deeply. CHERYL STRAYED: I was engaging with another writer who was saying things to me that we don't normally say to people in the public space. I always think of the "Dear Sugar" column as like therapy in the town square. LUNDEN: Now that town square is the Public Theater. The set is a kind of messy house where Nia Vardalos as Strayed's alias, Sugar, makes lunch for her kids or folds laundry while she answers questions from three actors who inhabit the very same space, playing a variety of ages and genders. UNIDENTIFIED WOMAN: (As character) How are you, Sugar? It's making me crazy. I want to know. What would a photograph of you look like? NIA VARDALOS: (As Sugar) A woman standing naked in the plain light of day. She's flawed but OK with that. Her hands are obscuring her face. You see everything but one thing. UNIDENTIFIED MAN: (As character) Why can't we see that one thing? Why can't we see your face and know who you are? VARDALOS: (As Sugar) You know who I am. I reveal myself to you in every column. LUNDEN: And in revealing herself, Sugar reveals more about our common humanity without ever telling people what to do or how to think, says Nia Vardalos. Sugar's not Dear Abby or Ann Landers. VARDALOS: The way Cheryl uses storytelling to reveal something about herself and make the person feel like it's OK, it's OK. You show me yours and I will show you mine. VARDALOS: (As Sugar) Dear Confused, the last word my mother ever said to me was love. She was 45 and so sick and weak. She couldn't muster the I or the U, but it didn't matter. That puny word has the power to stand all on its own. LUNDEN: "Tiny Beautiful Things," based on Strayed's collection of advice columns, came about because a friend gave director Thomas Kail the book. Then he gave it to Nia Vardalos. She read it from cover to cover on a flight from New York to LA, and through her tears, called Kail on the tarmac to say she wanted to adapt it. But she knew it couldn't be a traditional theatrical narrative. VARDALOS: I thought, I don't care if this is a play, if it's a monologue, if it's a theatrical experience. I can't worry about the finished product. I'm just going to explore. LUNDEN: Kail says that exploration has yielded an unconventional and emotional 75-minute theatrical journey. THOMAS KAIL: I wanted it to be an experience where you walked into the dark and this thing unfolded. And there was some sort of ritual that was embraced. And it wasn't about, these two meet, are they going to get back together? It was not about plot. It was about feeling. It was about empathy. It was about being heard. VARDALOS: (As Sugar) Love is the feeling we have for people we care about and hold in high regard. It can be light, as the hug we give a friend, or heavy, as the sacrifices we make for our children. It can be fleeting, everlasting, conditional, unconditional. The point is, you get to define it. LUNDEN: Thomas Kail says there's a reason Cheryl Strayed's words resonate. KAIL: And I think it's why the book has existed and been given to so many people is about something very simple. I see you. I hear you. You are known. LUNDEN: And he hopes audiences feel the same way when they see the show. For NPR News, I'm Jeff Lunden in New York.